There always seem to be groups of Pelicans along the waterways in Florida. When you can actually get close to them it amazing to see just how large they really are. Pelicans appear just as prehistoric looking as the Great Blue Heron. I could sit for an entire afternoon and watch their antics. 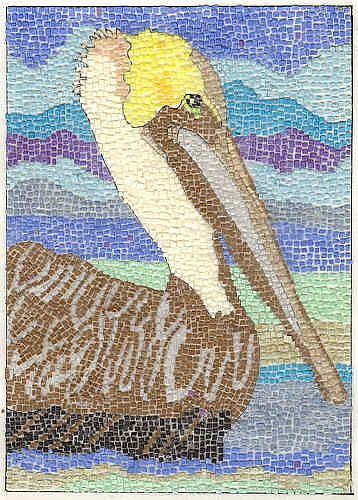 My 91 year old Mother has also done many sculptures of Pelicans so I know for sure that her work inspired this Micro Paper Mosaic piece.